Fulfill your dream of swimming in the sea with real dolphins with our Dolphin Royal Swim program! You will get to kiss, hug,and swim with your new pals for a full 50 minutes in the sparkling Caribbean waters. This tour also allows you to experience a foot push and a dorsal tow. Join us for an exciting, active experience you will remember forever! If you want a vacation activity that you will never forget, join us at Dolphin Discovery St. Kitts for our Dolphin Royal Swim program! This fun and exciting program allows you to get up close and personal with our charming marine mammals as you interact with them in the bright blue waters of the Caribbean. You can hug, kiss, and pet our friendly dolphins, as well as shake hands with them. They will put on an acrobatics show that is sure to delight every member of the family. The most thrilling part of the experience is the active interactions with the dolphins. Participate in a dorsal tow, where two dolphins pull you through the water on their fins. You can also participate in the foot push, where two dolphins will put their heads on the soles of your feet to push you up and across the water in a high flying feat! This activity is sure to take your breath away and create memories you will treasure for a lifetime. This dynamic program costs $149 for adults (defined as guests over 4'7") and $129 for kids (3'11" to 4'7" and at least 8 years old). This price includes a 10-minute briefing from our trainers and a 50-minute dolphin swim program. Please arrive at least 30-minutes before your reservation in order to ensure you are on time for your informational briefing. 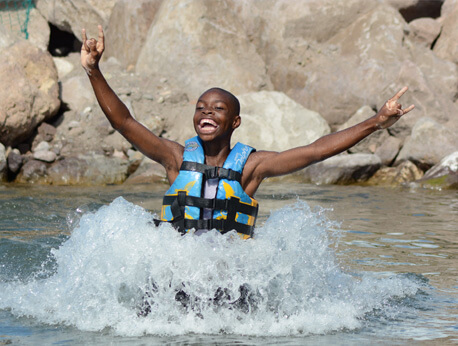 Because this tour involves moderate activity levels, we request that children ages 6 to 12 swim with a paying adult. Expectant mothers more than 5 months into their pregnancy cannot take part in our programs.However, 5 months and below can participate under the stipulation that they swim with another paying adult and sign a release form. Please wear biodegradable sunscreen for the well-being and safety of you, the dolphins, and the sea environment.